I remember the first tweet like it was yesterday. But then it was only about a month ago. Ireland’s #GE16 is now over and so, too, is the longest ‘shortest’ campaign in the State’s history. Journalists in Twitter filter bubbles rushed to declare, ahead of the election, that it would be the country’s first ‘social media election’ (it wasn’t) and serried ranks of party digerati sat down in front of Hootsuite and Buffer to wage war not just for hearts and minds but for likes and shares. I ran the comms and digital strategy for the Social Democrats, Ireland’s newest political party weighing in at just seven months old, and looking to scale the equivalent of the north face of the Eiger to get airtime and newsprint in a media environment hostile to new thinking. Back in September, someone had dragged me along to my first political meeting since the 1980s (Liverpool, trade unions, lots of fundraising buckets) to see SocDem co-founder Stephen Donnelly address a Friday night crowd in a Dublin hotel. There was a queue to get in. Friday night, and people were queueing to hear a guy speak. And as they queued, they scrolled. And as they scrolled, they strolled. Any device, scrolling, clicking, liking, sharing. Not a single newspaper in a backpack, pocket or under an arm. They were, mainly, young. And they were, mainly, an equal split of men and women. And, yes, plenty of neckbeards, plenty of Hello Kitty specs. Donnelly did his thing and I clapped, genuinely. And then we hunkered down for a coffee where I, a former Guardian and Daily Mail hack (I know, don’t ask), told him, to my astonishment, that he didn’t need newspaper coverage. We got a second coffee. A winter later and I’m in an attic in North Dublin with RTE’s Morning Ireland grinding on out of my phone and the discussion is on fiscal space. I fire up tweetdeck, the parties are already bombarding commuters and lazy lie-ins with yet more imaginary figures so I give them this. And that was my first tweet. A campaign later and the analysts are saying the Social Democrats had a great ‘social media election’ (still not getting it, it was a content marketing election). 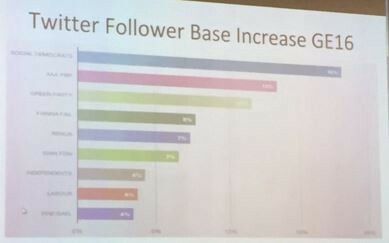 At the election aftermath conference for the Online News Association, Storyful founder and now Twitter’s Mark Little declared the SocDems ‘the most adept’ at using the Twitter platform. 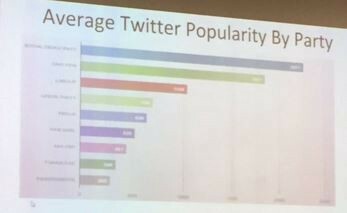 The same conference at Dublin City University was also shown data on the SocDem’s rise on Twitter. There were plenty of other similar analyses throughout the #GE16 campaign with commentators noting our niceness (yes, this is a metric, now) and our social velocity as well as our use of images to deal with tired political hackery tropes such as the ‘red line’ coalition questions at EVERY press conference. Ahead of the election we were told the ruling party Fine Gael had a ‘war chest’ to dwarf all others and that it would be deployed in the final week on Facebook and Twitter. Which was odd, given the demographic of a)their voters and b) the platform users. And even odder was how they used it. We used Twitter and Facebook to reach out and have a perpetual conversation with a savvy, media literate electorate who knew what they wanted. And told you so. They engaged. 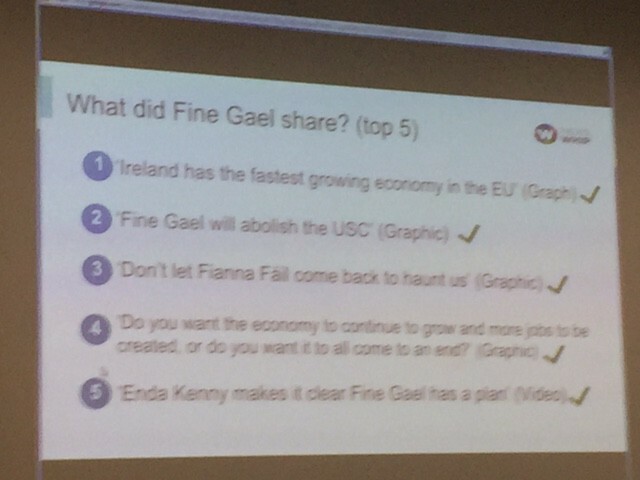 Fine Gael aped the didactic transmission methods of newspapers to TELL their audience what they had to do: Keep The Recovery Going and Vote Fine Gael. What would happen if you posted — and nobody cared? They used the visual vocabulary of the static Real Life billboard, we used the social norms of the mobile literate. This answer to the exclusion of small parties from the last televised RTE leader’s debate received our highest number of impressions. By the end of the election, our tiny party had 1.25m twitter impressions, engagement rates of up to 18 per cent, and on Facebook, where auto-play video content ruled, we reached 521,000 with engagement on our posts on the election period of 142,000. All good, but did it win us any more seats? No. But here’s a stat: during the election we had almost 64,000 profile views on twitter. And our share of the national vote? Some 3%, which funnily enough, is about the same. Now that’s a water cooler conversation worth having.